My 2nd Boston Marathon today. I spent the whole spring battling an abdominal injury and groin injury, but trained through it with the hopes of running. The buildup was actually quite good, although less than last year. When my aunt passed away in February, I made a GoFundMe page to support my uncle Jay and run this race in honor of her. That was my motivation for training through the injury. I was super nervous for this one starting several days to a week and a half out. Just really built it up a lot in my mind and I was nervous, excited, and anxious to get started - it felt like the last few days before the race took forever to get through. Partially this was because I wanted to make the race a good tribute to my aunt, and partially because the weather was looking absolutely terrible from forecasts as early as a week out. It seemed to only get worse with each passing day. Flew out on Saturday morning, got in a quick 4.2 miler before leaving. The flight was pretty uneventful, although my nerves were still high. Flew in through New York, should have just gone through Boston, but met my dad and we got a rental car and went up to Boston. Went to Cheers bar, my dad insisted, and standing there was my cousing, Jordan - completely surprised me. Apparently he had planned to join us out there as a surprise and as a way to watch me run for Colleen. Got my traditional whole wheat pasta at Olive Garden Saturday night. Went to the race expo on Sunday and picked up my packet. The weather was already deteriorating. It was in the low 30s and sleeting/freezing rain with the winds picking up. Kind of a foreboding pre-race day. Decided to drive the course to show Jordan, that was cool because it helped me refamiliarize myself with it. After that, went to the store to get the stuff I needed to make my usual prerace meal of white rice, chicken, and soup. I went back to the hotel, made dinner, and relaxed. Still was having trouble dealing with the nerves, but eventually found a way to get a whole 3-4 hours of sleep! Did not sleep well at all. Got up at 5 and showered, then started layering on the clothes I'd need for the Athlete's Village. Ate my pre-race ritual canadian white bread and turkey sandwich, bland as can be! Drove to Boston Common and my dad and Jordan dropped me off. I dropped off my drop bag and got on the bus. About an hour ride out to Hopkinton, as we got close I noticed there was snow on the ground - another foreboding sign. Got off the bus and went to the athlete's village. It was pouring down rain, very cold, and very windy. The meteorologists were spot on - terrible conditions for marathoning. The Athlete's village was a mudpit and there was standing water and ice on all surfaces, making it a sloppy mess. Fortunately, I packed and dressed smart. I had 2 sweatshirts, 1 undershirt, and my race clothes on top, then my shorts and 2 pairs of pants (one water resistant and one sweatpants) on bottom. I had a poncho on top and made a kind of pants out of a leaves bag to keep the bottom dry. I wore throwaway socks and shoes as well. I stayed as dry and as warm as possible, though I was still pretty cold, especially my feet. I changed into my racing shoes and socks about 9:20 and then joined the group heading down to the start line - instantly soaked everything through since it was raining so hard, but at least I was dry and had dry feet up until that point. Got loaded into the corral and got stripped down to my racing gear. Went with a heavier, underarmour type long-sleeve undershirt that was water resistant, wore my Colleen Strong tanktop I made (partially cotton, so would get soaked, but this was why I was running so definitely was going to wear it), shorts, gloves, water resistant beanie and hat, plus sunglasses to keep the water out of my eyes. I had put vaseline EVERYWHERE, so that was my attempt at avoiding chaffing. The starting corrals in Boston are an atmosphere unmatched in the running world - just an electricity of excitement and anticipation, all the waiting, the nervousness, the travelling, the training, it all reaches its crescendo as you await the gun. Then it went off and the corral slowly moved forward (I was in wave 1, corral 3). I crossed the start line about 1:45 after the start and was off running. First thing I noticed was my feet felt super weird. It was like running in snow boots, I could only feel the back 2/3 of my feet and it was like my toes were gone - I realized pretty quick this was because they were numb. This slowly came back, but obviously my feet remained cold and soaked the entire run. My goal in these conditions was honestly to just make sure I finished. I was in decent enough shape and wanted to get another BQ, but once I saw the weather, I was hopeful I could just get to Boylston. First 5k was 20:54, reached 10k in 41:59 (21:05), was feeling decent, nothing great, but not bad given the driving wind and rain, felt it smart to tuck in as much as possible. Missed much of the fanfare this way, but wanted to be smart about things. 15k was 1:02:55 (20:56), 20k was 1:24:10 (21:15), could hear the Wellesley girls from at least half a mile away - they were SO loud - it was as awesome or better than last year. I started to get emotional once I first heard them, I think it kind of woke me up out of the methodic plodding I had done for the first 20k and really was the first time i was like "I'm here in Boston - let's do this!" I had a paradigm shift after this emotional moment and from then on, my "head was in the game" and I was ready to fly. 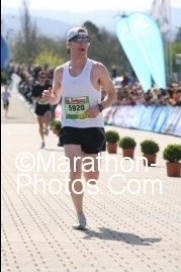 Half marathon hit in 1:28:43. My honest thought was that a sub-3 was probably out of the realm of possibilities today because you tend to give back time on the 2nd half of Boston. I was at peace though, and even as the downpours continued soaking us and the cold wind buffeted us from the front, I found a strange calm and steady determination to keep on moving. The second half of my Boston 2018 was going to be legendary. As I entered the Newton hills, I threw down the hammer and had this steely determination to get up all the hills quickly and then just utterly destroy Heartbreak. I was amazed at how much energy I had and was just talking to my aunt Colleen out loud the whole time, telling her this race was for her and I was going to do something incredible on the back half of the course. 35k- 2:27:51 (21:14), I ran the Heartbreak mile in something like 6:54, just amazing to get up that hill so quick. My fastest mile of the ENTIRE race was mile 22, I came flying off of heartbreak to a 6:34. As I entered Brookline and started into Boston, I was tiring a little bit, but I kept repeating to myself "watch what I'm about to do" "watch this!" It was motivating and honestly, I was fighting back my tears just knowing I felt great and I was going to triumph over the weather and adversity today. 40k- 2:49:13 (21:22), slowest 5k split, but only by 5 seconds. Incredibly even race. Finish - 2:58:29, 6:49 per mile! I was in tears all the way down Boylston and once I hit the finish line I lifted up my "Colleen Strong" shirt and pointed to the sky. I did it! It was for her and in her honor and memory, but it was for me too. I think this race was the catharsis I needed. I burst into tears as I walked to get my medal and through the rest of the post-finish area to the gear bags, I had left it all out there and the emotional floodgates were poured open. I was so happy and proud of what I had done. While not a PR, to run a 2:58 in some of the worst conditions I've ever run in was just incredible and I was so happy I got tough that 2nd half. What an awesome day, an awesome race, and an awesome city. I love the Boston Marathon and the event never ceases to create wonderful memories for me. Hopefully even though this is only my 2nd, there are many more left. I conquered this particular crusade at Boston and paid a great tribute to my aunt Colleen (along with the massive support from all my friends who donated on the GoFundMe page). However, I'm not done with Boston. I have more I'd like to accomplish there and I hope my 6:31 BQ is fast enough to get me back next year. Now I have to take some time off to heal this sports hernia, which will be tough mentally. But once I get healthy, I hope to come back stronger than ever! Wow, what a phenomenal post and race report! I got chills just reliving those moments, congratulations on another sub-3! Excellent splits, and what and incredible thing to do what you did for your Aunt. Runners like you make this an incredibly special community. Thank you so much for you kind words! I appreciate it! I�m glad you enjoyed the race report. It was a memorable day and I�ll never forget it! it sounds like it was an amazing experience. way to push through on a tough day, and what a great tribute to your aunt. congrats. Just happened upon your blog and read this 2018 Boston race report. Wow, what an incredible experience for you in so many ways. Great write up, I felt like I was there rooting you on. Well done, looks like you've recovered now. Best of luck in future training and races. Thank you for the comment, Russ! It was an incredible experience and I can�t wait for Boston #3 next year! Best of luck in your running as well.